The pristine Emerald Lake is the largest lake situated in Yoho National Park in British Columbia, Canada. 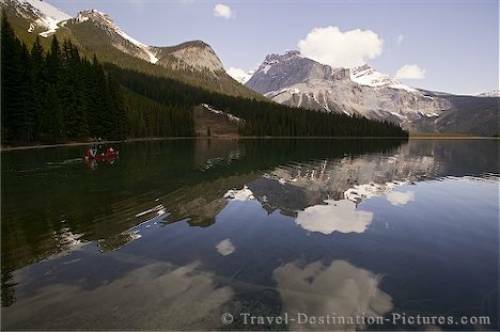 Emerald Lake was discovered in 1882 during the construction of the Canadian Pacific Railway. Soon after in 1902 a guest house was built on the shores of the lake. It is thought that when the guest lodge was closed, any remaining chattels not purchased and taken away from the site were taken to the middle of the frozen lake and subsequently sunk to the bottom when the ice melted. Whether this story is true or not, many visitors to Emerald Lake have donned wetsuits and diving tanks to explore the lake bed for clues and treasure. Emerald Lake itself is created by the glacial run off from the mountain ranges of Yoho National Park which feature a large number of waterfalls. Silt carried along the many streams, from mountan glaciers, which drain into Emerald Lake are what cause the turquoise colour of the lake. Picture of tourists canoeing on Emerald Lake in Yoho National Park, British Columbia, Canada.